Developed and race proven by leading professional road cycling teams like Trek Factory, Cannondale Garmin, Saxo Tinkoff, Orica Greenedge, Lampre Merida, Ag2R La Mondiale, Cofidis, Velocio Sram and many, many more, the AeroComfort 2.0 TSA™ is the most demanded bike bag in the world. Lightweight and comfortable, yet providing the required protection. You don’t need to be a professional cyclist to travel abroad with your bike. If you are not exactly familiar with the disassembly of your bike, then the AeroComfort 2.0 TSA™ is your prime choice, as it is simple to pack. When we say minimal disassembly of your bike, we mean it. All that you need to disassemble is the Quick Release skewers of your wheels. Complementing a good bike fit, you do not have to remove the handlebars and seat post. 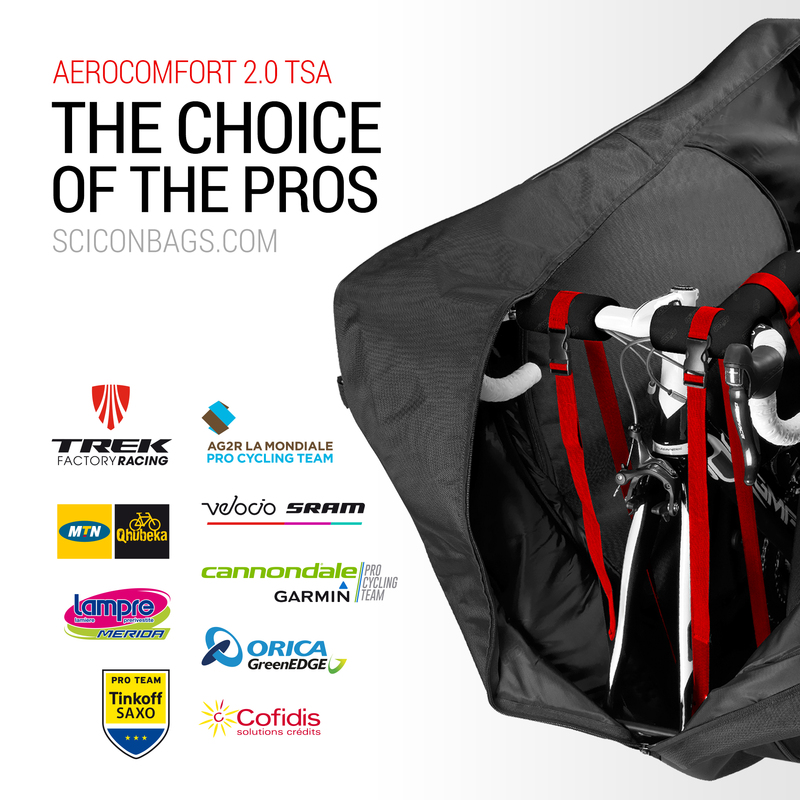 The AeroComfort 2.0 TSA™ is one of the few bike bags, that is suitable for road bikes with integrated seat post. Minimal disassembly of your bicycle, padded protection, dedicated storage space for all bike parts and lightweight material provide you with the confidence that you and your bike will arrive safe and sound at your destination. We even have you covered with a global limited lifetime guarantee! • When you receive your bike bag the first time, click here to register the product online. • The AeroComfort 2.0 TSA™ allows you to keep the handlebars and seat post in place. • You need to remove the wheels from your bike, which requires you to simply undo the Quick Release skewers. • The AeroComfort 2.0 TSA™ arrives with all the necessary protection you need to pack your bike. • If you choose to remove your pedals, you may need a pedal spanner but that's it! • Developed and engineered in Italy, the AeroComfort 2.0 TSA™ is the most functional and comfortable soft shell bike bag with internal structure. • Offering you the flexibility and lightness of a soft bike bag, while providing the stability of a hard case. • The AeroComfort 2.0 TSA™ folds down to a practical size to store away at home or your travel destination. The included carrying bag will protect it from dirt and dust. • Designed to hold virtually any racing bike frame up to 65cm as well as carbon frames with integrated seat posts (ISP). • A rugged and durable Nylon outer shell withstands abrasion and in combination with a thick layer of high-density foam padding, provides good protection. • At 8.9kg the AeroComfort 2.0 TSA™ is one of the lightest bike bags in the market, which allows you to stay on the edge of weight allowance for sports luggage on most airlines. • Mounting your bike on the integrated Antishock Bike Frame provides a rigid protection of the bike’s frame to absorb impacts. • Protect your rear derailleur from side impacts with the included Rear Derailleur Protector. • A clever, integrated belt system (SFS), holds your bike frame firmly in place just like a seatbelt. • Included in the delivery are two Scicon™ Quick Release skewers to mount the bike into the Antishock Bike Frame. Remember to fasten the Quick Release Skewers well! • An internal storage pocket with zipper will hold your wheels original Quick release skewers and any other tools you may want to carry. • A set of padded, reusable Nylon tubes with Velcro fastening for handlebars and top tube, provide extra cushioning for the Internal Strap System and protect from abrasion. • Two padded wheel pockets with zipper, protected from the outside by A robust lateral shield cup made out of rigid thermoplastic polymer which distributes the force from side impacts. • The detachable, bidirectional shoulder strap, makes carrying the AeroComfort 2.0 TSA™ on your shoulder easier. Remember to remove the strap before flight and to store it in the dedicated outside pocket on the front of the bag! • Four resistant, smooth-rolling 40mm multidirectional thermo-rubber wheels make moving at airports a breeze. • A flight tag will find it’s place in an integrated slot, neatly hiding on the side of the bike bag. • A dedicated accessories bag equipped with a Velcro strap to fix it inside the bike bag to stop it from moving around, allows you to safely store additional tools or accessories. • A Travel Sentry® approved TSA padlock ensures the safety of your bike as well as authorized access to the bike case to customs authorities in the USA and the UK. • Although there is some debate whether it is strictly necessary, it is worth to deflate your tires, as you are probably going to be asked to do so at the airport, if you haven’t done so. The Scicon™ Swivel Head Mini Pump, included in the delivery will help you getting back on your bike on at your destination. • And should you ever loose sight of your bike bag, we have you covered with a compact address tag to make sure the bike bag finds back to it’s owner. • Remove any accessories from your bike, like a GPS unit and bottles. Any loose items in the bike bag can scratch or damage your bike frame. • If you have electronic gears, remove the battery and store it in your hand luggage. • Carry your helmet, pedals, shoes and GPS in your hand luggage. Should the delivery of the bike bag be delayed, you could always switch to a rental bike. • Always inspect your luggage immediately upon receipt at your destination and report damages immediately to the airline. Does a bike with disc / thru axles fit this bag?